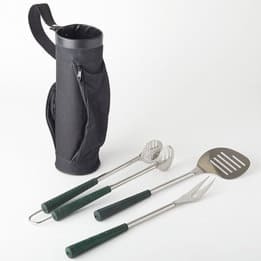 Whenever someone says “barbeque accessories”, I think “Oh, yes – you mean tongs and spatulas and stiff cleaning brushes”. And that’s true, they are barbeque accessories, but there is so much more available to make barbequing a fun and interesting experience. Himalayan salt has long been renown for its health benefits. It contains not just salt but many trace minerals such as copper, calcium, magnesium, potassium and iron that can improve the body’s hydration and help to balance its pH. It’s pretty yummy too. Himalayan salt crystals are very stable and will hold high heat so you can sandwich small cubes of salt between pieces of your favorite kabob dish for that extra dash of flavor. Or you can grate them over the food. And what about cooking on blocks of Himalyan salt? According to Chef Mark Bitterman, “unusual chemical reactions happen by cooking on hot salt that you just can’t replicate any other way. With bacon or duck breast, it produces a texture of crispy, fatty bacon or duck skin that is better than anything you’ve ever had. Scallops – it’s just the most remarkable crispy golden crunchy browning of a scallop. 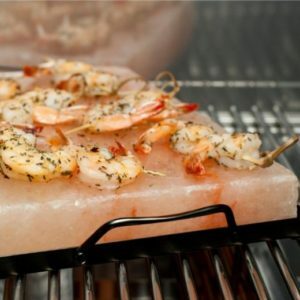 It’s a technically superior way to cook something.” Some people even use Himalayan salt blocks as serving platters. Cleaning the block is just a matter of scrubbing the moistened block with a green scouring pad (with no soap or detergent) to remove any food particles and then wiping it clean with a sponge. This is an interesting idea that uses a large fruit, usually a watermelon or a pumpkin, to dispense beverages. Pineapples can work too. Slice off a small portion of the fruit at the top to create a lid. Then scoop out the pulp to fashion a hollow container. 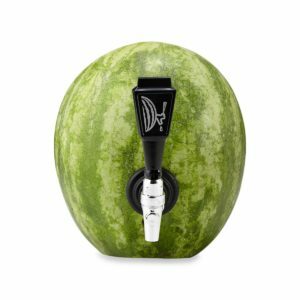 Use the coring tool that comes with a fruit keg tapping kit to make a hole two or three inches from the bottom of the fruit and insert the faucet through the hole you’ve just made. You then fill the fruit with the beverage of your choice, perhaps some kind of punch that you’ve made from the pulp you scooper out earlier, and put the lid on. Et viola, beverage on tap! A coldy-holdy – also called bottle jacket, can cooler, coolie, coozy, and a variety of other names – is a sleeve that fits over a bottle or can to insulate your beverage from sources of heat such as your hand or the ambient air to keep it nicely chilled. 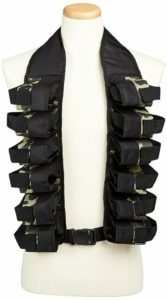 The sleeves are generally made of neoprene, polyester, various open-cell and closed-cell foams, vinyl, and sometimes leather. There are floating coldy-holdys for the aquaphiles and they’re also available in multiples configured into aprons or vests for those wanting to make a kind of Delta Force fashion statement. Although many of us enjoy lifting the barbeque lid for a whiff of that wonderful aroma, for tech-savvy chefs, there are bluetooth and WiFi grill thermometers that allow you to remotely monitor the temperature of the grill or smoker. There is a myriad of different types with a huge assortment of features available but the basic idea is that these units use one or more probes for monitoring the temperature of the item(s) being cooked or smoked. If the temperature becomes too high or too low the device will send an alert to your phone, iPad or other electronic device using either its own remote or through an app on your phone or device. WiFi devices generally give a longer range of distance than Bluetooth. When it comes to grill tools, there’s everything from inexpensive stamped steel sets available at most box stores all the way up to high-end forged high carbon stainless steel sets with handles made of exotic woods that most people have never heard of. And everything in between. But you would be amazed at the number of “themed” barbeque sets there are. For sports enthusiasts, there are tools that look like tiny golf clubs sporting insulated handles that look like golf grips, complete with a bitty little golf bag to store them in. There are tennis themed sets, baseball themed sets, football themed sets, soccer themed sets, and pretty much every other sport with the possible exception of skydiving. You could get a set of camo grilling tools for those occasions when you want to channel your inner Rambo. Or, for those who just can’t seem to leave the office behind, how about a 20-piece stainless steel set of grilling tools housed in a metal briefcase. 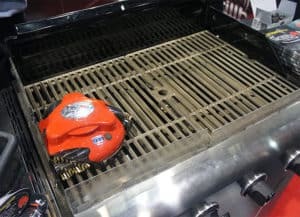 We have robotic vacuum cleaners, floor mopping robots, gutter cleaning robots, and even self-cleaning cat litter boxes, so why not a grill cleaning robot. The battery-powered device has three replaceable wire brushes, each powered by an electric motor. The brushes are removable and dishwasher safe, and there are different types – stainless steel brushes for cast iron grills and brass for stainless steel or porcelain grills. Place the robot on the cooled grill, push a button, close the lid, and just let it do its thing. It will notify you when it’s done. Aaaahhhh, the luxury of not having to scrape and scrub the grill by hand!